The city of Spokane, Spokane County and Spokane International Airport have teamed up to focus on attracting manufacturing businesses to 9,000 acres of West Plains land. Big headlines lately have blared the wild, long-shot possibility of Spokane attracting Amazon's second headquarters. 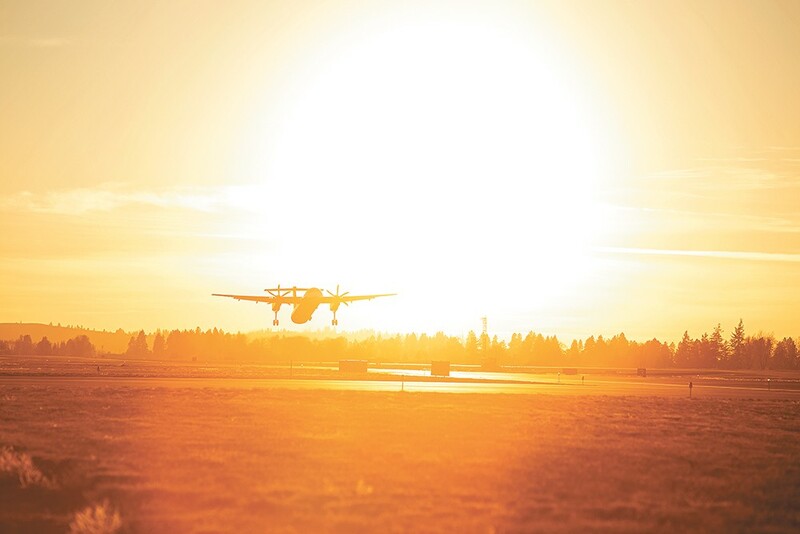 Yet last month, local officials embarked on a more long-term and feasible strategy to bring new jobs to the region: Three governmental agencies have united in order to clear the runway for major new industrial businesses to land in the West Plains area of Spokane County. Spokane City Council President Ben Stuckart, City Administrator Theresa Sanders and Spokane County Commissioner Al French have a few things in common. They're strong-willed, opinionated and when they have a goal in mind, they move fast. And they've all clashed with each other in visible ways over the years, particularly over questions of growth and borders. But on Friday, Stuckart, Sanders and French — joined by Spokane County Chief Executive Officer Gerry Gemmill and Spokane International Airport CEO Larry Krauter — were all around the same table and all on the same team. They're the board of the West Plains Public Development Authority, a zone encompassing Spokane International Airport and a little more than 3,000 additional acres of county and city land to the north and the south. They're already giddy about what this team could mean. But with big potential comes a big risk. That's why they're looking to recruit two new board members from the private sector — and hiring an new executive director — to round out the team. "We need private sector help on the board, that's excited like us, so we don't make the wrong investments," Stuckart says. "If we make the wrong infrastructure investment, and we spend all your money up front, and it blows up, that's a risk." The genesis of the West Plains PDA started back in 2012, during Stuckart's first week in office. "Al came over to City Hall," Stuckart says of Commissioner French. "Al's big idea at that time was that the city and the county needed to figure out a way to profit-share and get rid of some of our boundaries." To do that, the county and the city first needed to build trust. In particular, French was concerned about annexation. That January, the city had annexed major parts of the West Plains. For decades, annexations had been a point of contention between the county and the city. Just when it seemed like the county had a business center that was really thriving, like the Costco on the northside, the city would swoop in and annex the property, depriving the cash-strapped county of crucial tax revenue. As a result, the county was tempted to play defensively. At one time, Gemmill says, the county was thinking in terms like, "I've got to be careful where I'm putting the infrastructure dollars, because if it develops, the city will come in and annex it." That zero-sum mindset similarly trickled down into the efforts to attract new businesses. It was a competition, not a collaboration. "If the city won [a new business], the county lost it," French says. "If the county won, the city lost." In the past few years, the county has been trying to turn the West Plains area near Spokane International Airport into a haven for manufacturers, especially those in the aerospace industry. One big vision is to create what amounts to an assembly line of assembly lines — a manufacturer that makes airplane seat parts, for example, could locate right next to the assembler that puts airplane seats together. But while Spokane County had some major successes attracting industrial businesses to the West Plains, including Caterpillar, Aero-Flite and the Exotic Metals Forming Company, it was losing out on others. A new manufacturing plant needs land, a facility to locate in, water connections, sewer hookups, stormwater drains and connections with major road or rail lines. Some of those could be provided by the county or the airport, while others — like water lines — need approval from the city. Most counties in Washington state have at least one "port district," an entity that can raise taxes, build new pieces of infrastructure and offer businesses additional incentives. But Spokane County is an exception — previous attempts to create a port district have failed miserably. As a result, the Spokane region has already missed out on hundreds of jobs due to not having the right infrastructure in place, French says. This year, Spokane International Airport managed to get $2 million to add an additional railroad connector off of the Geiger Spur line, a crucial stretch of track for industrial businesses to ship products in and out. That's good news, French says, but the county has already missed out on two businesses that would have moved to Spokane had the spur already been in place. "There would be 500 jobs up on the West Plains today that aren't here now," French says. "Not being ready is not an option." That's why the West Plains PDA was created: To strip away all that bureaucracy, that rivalry and those roadblocks, and speed the development of new businesses. The board held its first meetings in September. First, the PDA was a way to prevent further city annexation in the region. The county has it in writing. "As long as the PDA exists," Stuckart says, "we won't be annexing anything on the West Plains." Not only that, French says, the city and the county won't have to compete against each other. A revenue-sharing agreement means that it doesn't matter if a new manufacturer moves into county or city land within the PDA — the two governments split the tax revenue. "Fifty percent of something is better than 100 percent of nothing," French says. "Through this, we all win. We all share. We all partner. That's the difference." Next, French says, it cuts through the bureaucracy, creating an easy one-stop shop for prospective businesses. "A business wants to come into an area, they go to the county and say, 'OK, what can you do for us?' They go to the city: 'What can you do for us?' They go to the airport, and 'What can you do for us?'" French says. "Now, that's one conversation instead of three." Not only that, the airport, county and city can pool all of their resources intended to attract businesses. "When you combine these jurisdictions' economic incentive packages, they're a lot stronger together than they are separately," Gemmill says. The PDA is not quite a port district — it doesn't have the ability to levy taxes — but it can do everything else. "We look at this as 'port district lite,'" French says. When new businesses are built in the PDA, three-fourths of that tax revenue goes back to the PDA to build more infrastructure, to attract more businesses, to generate more tax revenue. "The goal is to get as many of these sites shovel-ready, obstacles out of the way," French says. "So that when a business comes here and says, 'Are you ready for us to build?' we can say, 'Submit the drawings, we'll permit ya.'" First, the PDA is looking for two additional board members, ideally with private sector experience in advanced manufacturing, logistics, business development or industrial park operation. Applications, due Friday, Oct. 13, can be submitted online at spokanecity.org. Next, the PDA will search for an executive director. "But in the meantime, we're already moving forward to, 'We could do this and this and this,'" French says. After all, many of the region's weaknesses can be linked back to the region's low median income. "Say you provide 3,000 new middle-class jobs out on the West Plains," Stuckart says. "I bet you recidivism rates at your jail go down. I bet you see an improvement in your homeless populations, if we provide good middle-class jobs." Good jobs tend to spark a chain reaction of growth that economists call the "multiplier effect." "All of our bets on the future are determined upon robust growth," Sanders says. It brings French back to something that a speaker at a Greater Spokane Inc. presentation said last week.